Last Saturday, before golf my husband and I were having our morning coffee out on the deck enjoying another beautiful summer morning. We were talking about our past week (okay, maybe I was doing most of the talking) and I was going on about one of my clients and the interesting work we were doing together around culture and leadership. Out of the blue, my hubby says, “Leadership is such an overused term. What does it really mean? Isn’t everyone a leader?” Well, imagine my anguish, he had hit me right between the eyes of my passion. Of course, I became defensive and began to respond with all sorts of blather. What I should had said was, “Tell me more about what you’re thinking” and then shut up. Sounds simple, but it’s so much like my golf game. So difficult and at the same time, so rewarding – and never completely mastered. Thinking back on my career and my experiences in both corporate and volunteer settings, I think an important part of my leadership came down to how I “showed up”. Was I present in the moment? Was I really listening and learning? Was I inspiring and trusting? How do you “show up”? Does your leadership create a culture of achievement, engagement, collaboration and learning? 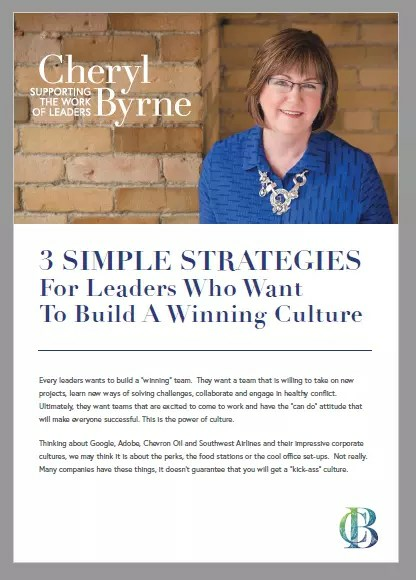 If you’re new to leadership at any level or if you’re a seasoned leader challenged with a new position or a new team, I have a small reminder of the three simple strategies that we need to keep in mind. Keep practicing these basics and like golf, or any sport, the skill will improve and the rewards will be greater.